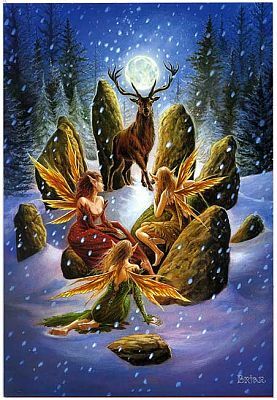 - Within a circle of standing stones, a trio of fairies gazes in wonder as the Horned God, appearing before them as a magnificent stag, stands with the full moon framed by his antlers. Card measures 8" by 5 1/2"
If you have never seen the artwork of Briar, you are in for a real treat. Briar is one of England's leading mythological artists. His subjects evoke a time of ancient magic and mystery. Cards are individually wrapped with cellophane. 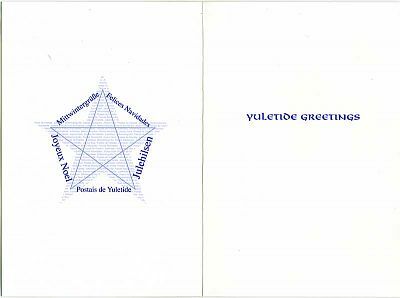 Inside message reads "Yuletide Greetings". Do you have any other questions about our Yule Stag Greeting Card? Bought several cards last year. This was one of the favorites. The Stag is a little protrayed character in cards and such and so important. Remember to look for great bargains on "reindeer" images after christmas. I have been able to do several altar backgrounds with wonderful STAGS like this card. One but...I don't like all the faeries/fairies so much and fab artists don't make all the women so perfect, so california cutie.